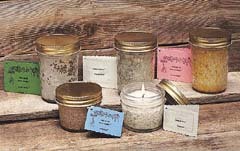 Premium aromatherapy blends hand crafted into high quality candles. Convenient ordering online using PayPal (you do not need a PayPal account to order) or print out the order form and fax, phone or send in your order. 4 oz variety 3 or 6 packs - good value - a great way to find your favorites! 8 oz by the case (dozen) - best value! NOTE: To get the 12th candle free, order 11 through shopping cart and add 12th flavor choice to note box at checkout. Italian 12.5 oz by the case (eight) - 25-40% off retail - Our elegant Italian glass candles - 3 times the candle at only 1/2 the price! NOTE: To get the 8th candle free, order 7 through shopping cart and add 8th flavor choice to note box at checkout.